hero of legend…on Mars! 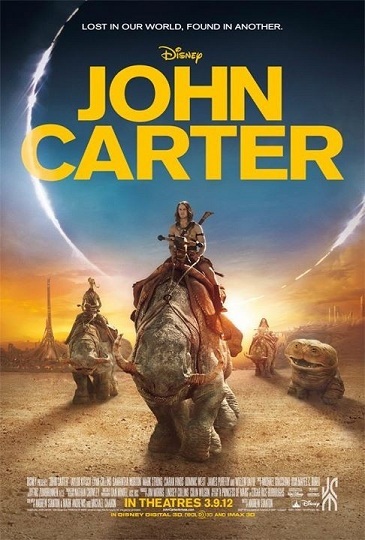 Ok, I am not such a fan boy that I cannot move on from a famous literary property’s debasement on film, but the reasons “John Carter” failed did interest me. I always wondered why a film with such potential went so horribly wrong. Then I read “John Carter and the Gods of Hollywood” and I understood. I know this book is not game related, but the behind the scenes view of the vicious office politics, financial implications and marketing really educated me on how a big-budget film gets released. Most of theses “tent pole” releases tend toward geek culture so it is worth understanding where the next big sci-fi moving is coming from and how it gets made. Michael Sellers is an independent filmmaker that worked around the periphery of big Hollywood films, but is also a huge Edgar Rice Burroughs fan. As such, he managed to inject himself into the marketing process of “John Carter” and meet many of the players that developed the film. To be clear, this book is not about the film itself, but rather the process of bringing the book to the screen, marketing the film and dealing with the catastrophic financial aftermath. The author spends some time covering the film history (or lack of) of John Carter from its start to the 2012 film. The history of ERB books and film is worth the price of the book, but one line brought a tear to my eye. In the late 90s, George R. R. Martin worked on a script for “A Princess of Mars.” I nearly wept at the thought of a hard “R-Rated” version. Martin is brutal, brutal enough for Burroughs’ vision of Barsoom. The lost opportunity was tragic. The book then moves on to the failures in development, shooting and especially the marketing of the film. Marketing takes most of the lumps because they did not understand the market, the history of John Carter or even what the film was about. The author especially harps on the lack of awareness by marketing that other movies for decades mined ERB books for inspiration. Ignorant marketing made the film seem like a cheap “Star Wars” knock-off instead of the inspiration for “Star Wars” that it was. Interestingly, the author took the time to do quantitative comparisons between “The Hunger Games” marketing effort and “John Carter.” Counting tweets, posts on websites and planted press releases showed a stark contrast between the two efforts. It is very clear which one did the better job. The film media (print and web) also receives scrutiny because of the cozy relationship with the marketing teams and certain “independent” movie fan sites and the mainstream Hollywood media grabbing on to the “out of control” production meme and helping bury the film with bad press. The book is not perfect. The author gives himself and the fans a bit too much credit and potential impact on the film and he is a bit of a fan boy when it comes to a potential sequel to the film. That said, it is a fascinating look into how a big-budget film gets made and the bloody, often treacherous path from book to film.